I'm writing to you from under my covers, in my pjs, with five inches of snow right outside of my window. Here in northeast Ohio, our winter season is always kind of hit or miss. Some years we have some pretty big snow storms, like last night, and sometimes it's sixty-degrees on December twenty-fifth. You never know what to expect, but I am a sucker for a white Christmas. With school closings and unplowed roads, this unexpected white-out has given me the opportunity to slow down and have a morning to myself. I've been feeling a bit off lately and I know it's because I don't have the time to do things that I enjoy doing. I leave for work before the sun rises and I come home after the sun has set. I don't have time to make an aesthetically pleasing lunch everyday, or even the daylight to take a picture of it. For anyone trying to keep up in the online food world, you can't understand how defeating it can feel. So, I'm grateful for this little snow shower and the quite moments it has brought, I think someone knew I needed it more than I did. These are the 'universe has your back' kind of moments. Cookies are one of my favorite holiday desserts. From the classic sugar cookies to crazy new creations, I love them all. When I was young, two of my al time favorites were the gingersnap and molasses crinkle cookie. I remember how shocked my grandma would pretend to be every year when I told her how much I loved her molasses crinkles. It definitely wasn't your average kid-favorite cookie, but I just loved how spicy and unique it tasted. My palate has not changed too drastically over the years and I still enjoy anything and everything with good depth and even better texture. I love when cookies are flavorful and chewy and sweet without being too sweet. I know I'm a plain jane when it comes to most things, but it's because I really love tasting every ingredient and the realness of the food. 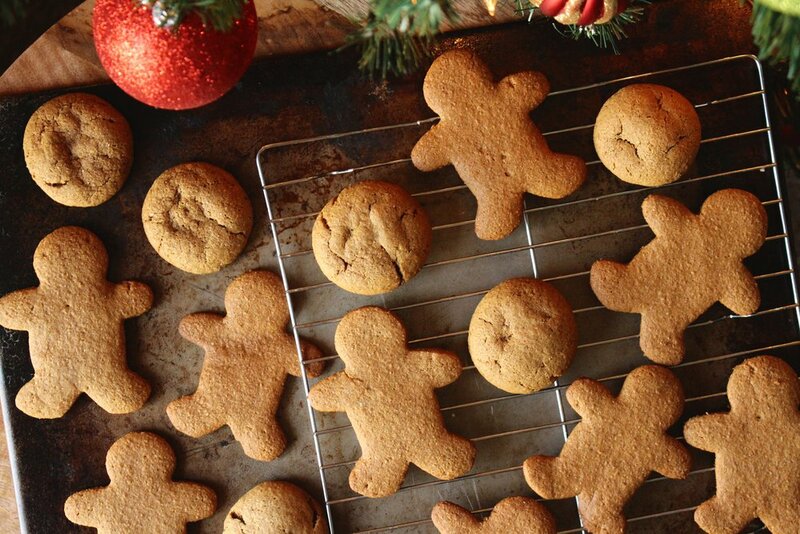 I decided that my #healthiestholiday dessert guide wouldn't be complete without a classic gingersnap cookie. They're a tradition in our house and truly make the cutest cut-outs. This recipe is easy to follow, fool proof, and much better for you than the classics. Much like my sugar cookie recipe and my peppermint fudge brownies, I have omitted refined white sugar and flours. I'm using ingredients that are in their natural state with wholesome nutrients and benefitting purposes. Swapping empty calories for nutrient-dense ingredients is much easier than you can image, and trust me when I tell you, it is so worth it. Just a reminder, my gingersnap recipe is healthier than others, but it is still a cookie. I am still using sugar, oil, and flour and they still have calories! I can't say I haven't had them for breakfast before, but you know, maybe not for every breakfast. None the less, I hope you and your holiday guests love this healthified recipe as much as we do! Using a large mixing bowl, whisk together the coconut sugar, maple syrup, coconut oil, and molasses. Add the egg and 2 tbsp. of water or milk. Continue to whip until fully incorporated and creamy. In a separate bowl, combine the flour, baking soda, salt, cinnamon, ginger and ground cloves. Carefully pour the dry ingredients into the wet and continue mixing. If needed, use clean hands to further work the ingredients together until a solid ball forms. Wrap the cookie dough in plastic and let chill for one hour. Preheat the oven to 350ºF and line a cookie sheet with parchment paper or a silicon baking mat. Roll the chilled dough into 1-inch balls, slightly flattened, or 1/2 inch sheet for cut out cookies. Bake for 10-12 minutes until puffy. For a softer cookie, watch carefully and bake for 8-10 minutes.